The Suzuki V-Strom 650 Adventure offers a V-Twin fuel injected 645cc motor with good fuel economy, power (66hp) and reliability. The bike is heavy but has a low seat height and can be ridden by smaller riders. The V-Strom 650 Adventure is oriented more towards street riding with cast alloy wheels, soft suspension and 19 inch front wheel. The V-Strom can handle graded dirt roads with confidence but is not designed for anything more technical. 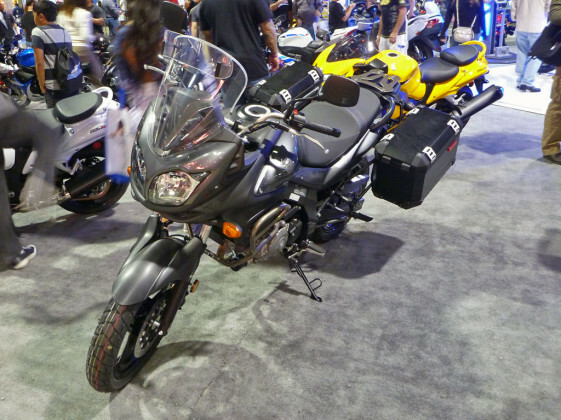 The V-Strom Adventure is a great value with factory panniers, tall windscreen, large tank (5.3 gallons) and ABS included in the price.